The 2000 is our most advanced drinking water filtration system and our most recommended water filter. There are many reasons why you should choose to filter your water- to read about them, click here. The 2000 comes, by default, with Definative Cartridge set. It has been especially designed for UK water. It filters out chemicals, bacteria, sediments and pollutants whilst keeping in all the minerals and nutrients essential for good health. It is the perfect cartridge set for almost every case. However, you may choose an alternative 'specialist cartridge' (note that that standard filter set is more than capable of removal typical levels of these contaminants in addition to the job jobs it does). Filter configurations for specialist medical or health requirements are available- just get in touch. This system comes with a free reminder system when it's time to replace your cartridges. So you never have to worry about forgetting and you'll always have the highest quality drinking water on tap. For more guidance, Glossary of Terms, Inspiration & Advice and other information, please browse our website or feel free to Contact Us. Available for collection at HQ, just order over the phone on 020 8539 4707. The following table lists all the harmful elements in your water that the Definitive Cartridge Set for the 2000 Drinking Water Filtration System removes, and the quantities in which it does so. It also gives you the dimensions of the unit. Our products and solutions are no different from any other appliance buy or home/ office improvement you make. To help makes things easier for you, we've given a guideline on the approximate skill-level and time involved in the installation of this product. The 2000 comes with everything you need for installation (apart from the tools and labour). Please note: some of you might think you're handier than you are! This is a guideline only, intended only to help you understand how simple installation is and whom you could ask to do it for you. If you were unsure, we would recommend getting the professionals in! Feel free to download our full filter installation guide on the downloads tab or see below for a step-by-step cartridge changing guide. Below is a simple nine step guide on how to change your water filter cartridges. Open tap and leave it in open position during changing your cartridge. 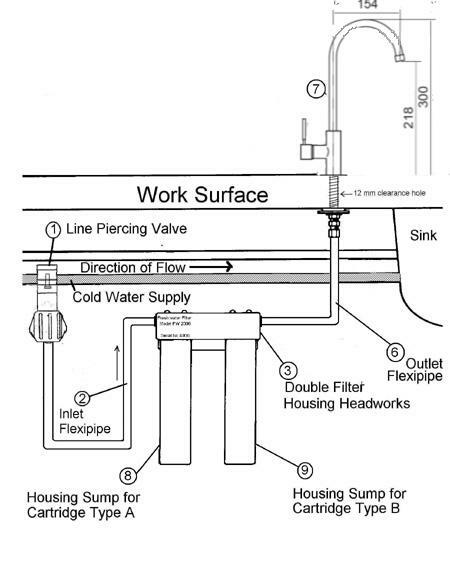 Turn off the water line piercing valve under the sink; follow the tube from the inlet of the filter housing. Turn the T-Bar clockwise to close the valve. Opening the filter is very simmilar to opening a jam jar (with the head of the filter being the lid) Holding the headworks tightly in one hand and the housing stump in the other, twist the stump clockwise to release it. In some cases it may be difficult to open but with the correct leverage and strength applied the housing and headworks should seperate. Remove the old cartridge by tipping the housing body sideway over a bowl or sink. Dispose of old cartridge. Check the internal sealing rings inside the headworks and 'O' ring washer on the housing body are correctly located. (Lightly grease with silicone or petroleum jelly if necessary). Screw together the housing(s). Don't over tighten! Turn on the line piercing valve and run the water for a few minutes and adjust the flow rate for the optimum for performance to 2.5-3 litres per min or 10-12 sec per pint. Flush away approximately 5-10 minutes of water or until the water becomes clear. Close the tap. The unit is now ready for use. All your questions should be answered here. Even more information may be found on our Inspiration & Advice and glossary pages. If you need further advice, then please get in touch. What does the 2000 filtration system remove? What does the 2000 filtration system leave in the water and why? Will there be a noticeable difference in the quality of water? How does the 2000 filtration system work? How will I know when I need to change the cartridge? How easy is it to change the cartridge? How much space does the system require? Does the 2000 filtration system require the use of chemicals or electricity? What is the operating pressure of the 2000 system? What is the flow rate from the pure water supply? What are the minimum and maximum temperatures the system should be subjected to? Can I purchase the 2000 filtration system without the tap? Does the 2000 filtration system soften water? Do I need to purchase a separate filter for the water dispenser in American style fridge or for my instant hot water unit? Will the 2000 filtration system stop my kettle from scaling up? How do I clean the tap without damaging the finish? Is the 2000 filtration system guaranteed? Does the 2000 filtration system remove nitrates? Will the 2000 filtration system fit a sink with a standard size hole? I have heard that water filters breed bacteria, is this true? Why is my water a milky colour? 1) Question: What does the purifier remove? Answer: The 2000 system removes a broad range of contaminants from water. Contaminants found in water can essentially be placed in three different categories - microbiological, chemical & aesthetic. Impurities within these categories that are removed by the 2000 system include - harmful bacteria, protozoa organisms, chlorine, trihalomethanes, volatile organic chemicals (VOC), synthetic organic chemicals (SOC), foul tastes & odours, rust particles, sediment, aluminium sulphate and numerous other undesirable elements including dissolved and particulate metals. 2) Question: What does the purifier leave in the water? Answer: The 2000 System is designed to remove virtually all harmful contaminants from water while leaving minerals essential to good health and taste intact. Calcium for example contributes to the overall taste of drinking water, is a major component of bones and teeth and is essential for various bodily processes such as blood clotting. The minimum required concentration of calcium in drinking water has been set by the EEC at 60 mg per litre. While some products such as distillers and reverse osmosis systems remove calcium and other beneficial elements, the 2000 filtration system has been designed to remove only harmful contaminants while leaving in essential minerals. 3) Question: Will there be a noticeable difference in the quality of water from the pure supply? Answer: Yes. Most people immediately notice a significant difference in the overall quality of purified water when they install a 2000 system. The extent of this depends largely on the level of contaminants in the water and individual sensory thresholds. Most complaints relating to the taste and odour of tap water are due to the presence of chlorine. As the system also removes wide range of impurities and contaminants, people often notice a marked improvement in the clarity and taste of the purified water. Pure water enhances the flavour of tea, coffee, soups and cooking in general. 4) Question: How does the 2000 system work? a) An outer shell of microporous ceramic on the 'A' cartridge removes harmful bacteria, protozoa cysts and all particles above 0.9µ (micron). The ceramic element is proven to remove 99.99% of particles between 0.6 - 0.7µ (micron). For comparative purposes a red blood cell is approximately 5µ (microns) in size while the lower field of human vision is estimated at 20µ. b) A premium grade anthracite based Granular Activated Carbon (GAC) to complement Stage (d) for the elimination of organic pollutants. These include chlorine, pesticides and other organic chemicals, foul tastes and odours and numerous other undesirable impurities. c) Separation baffle to counteract channelling and improve contact time. e) Selective ion exchange resin to especially remove dissolved heavy metals such as lead, copper, cadmium and mercury. f) A pure polypropylene sinter to prevent escape of any filtration media. After purification the water continues through its own separate channel and is dispensed via a purpose made elegant ‘touch-flo’ tap. 5) Question: How will I know when I need to change the cartridge? Answer: After 12-18 months of use the filtration media begins to lose its effectiveness, usually coinciding with a significant decrease in the pure water flow as the ceramic outer section begins to clog with contaminants. When you buy a 2000 filtration system we will automatically put you on a 12 month reminder system so you don't have to remember when it's time to change. This doesn't mean you'll be charged but simply that we will get in touch to tell you're due for renewal to get optimum performance from your filter. You can opt out at any time simply by letting us know. 6) Question: How difficult is it to change the cartridge? Answer: The procedure for replacing the cartridge is very simple and takes only a few minutes. The company does provide a call out cartridge replacement service thought this is very rarely required. Full Instructions explaining how to change the cartridge can be found in the installation Instructions and also come with every Replacement Cartridge. 7) Question: How much space does the system require? Answer: The system takes-up very little space: the purifier, which is only 31cms high, will fit neatly under the sink in any size base unit. 8) Question: Does the 2000 filtration system require the use of chemicals or electricity? Answer: No. 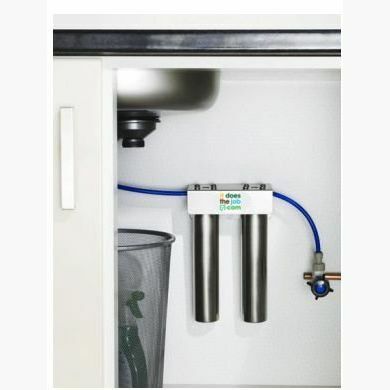 The system has been designed to work from mains water pressure, does not require the use of any chemicals and the cartridge is constructed entirely of natural. 9) Question: What is the operating pressure of the 2000 system? Answer: The system works on normal mains pressure. The maximum pressure that the unit should be subjected to has been calculated at 75psi (5 bars), and the minimum recommended pressure is 25 psi (1.7bars). Average mains pressure falls somewhere between the above while the pressure from a header tank in a bungalow is likely to be lower than the recommended minimum. Small pumps are available to deal with low pressure situations and pressure limiting valves can be supplied for households experiencing a higher than average water pressure. 10) Question: What is the flow rate from the pure water supply? Answer: On normal water pressure the average flow rate of the pure water supply can go up to around 4 litres per minute. For optimum chemical removal performance, the service valve can be adjusted to provide a flow rate of around 1.5 to 2 litres per minute. 11) Question: What are the minimum and maximum temperatures the system should be subjected to? Answer: The 2000 filtration system should never be subjected to freezing temperatures as this can damage the unit. Damage can also occur if the purifier is connected to a hot water supply. 12) Question: Can I purchase the 2000 System without the tap? Answer: Yes. The 2000 System has been designed as a complete system but the housing and cartridge can be used for many different applications and can be plumbed in-line to coolers for instance and customers own individual taps. Please refer to technical specifications for flow rates and capacities. 13) Question: Does the 2000 system soften water? Answer: No. The 2000 System is not a water softener but can be used in conjunction with a household softener thereby supplying hot soft water, cold soft water and hard pure drinking water. Hard water is good for drinking while soft water is beneficial for bathing and other uses that do not involve the actual consumption of water. 14) Question: Do I need to purchase a separate purifier for the water dispenser in my American style fridge or for my instant hot water unit? Answer: No. A special fixing kit incorporating a tee piece is available, thereby allowing two separate supplies of purified water to be drawn from a single unit. 15) Question: Will the purifier stop my kettle from scaling up? Answer: To a degree the answer is yes, though this reduction will be limited and depends on the overall chemistry of the water. The 2000 System is not a water softener, and unlike some filters, does not remove the minerals essential to good health and taste. Calcium and magnesium, perhaps the most essential of these minerals, are the cause of scaling. Some contaminants combine with these minerals and by removing the contaminants the scaling effect can be reduced. When water is boiled, some of the temporary hardness (in the form of calcium carbonate) precipitates into the water. In extreme cases this results in the appearance of white flecks in the boiled water or as a surface film on tea and coffee. A convenient remedy for this problem is to use one of the new generation of kettles now available. These kettles incorporate a fine mesh screen that remove the precipitate but not the dissolved minerals, thereby complementing the use of the 2000 system. 16) Question: How do I clean the tap without damaging the finish? 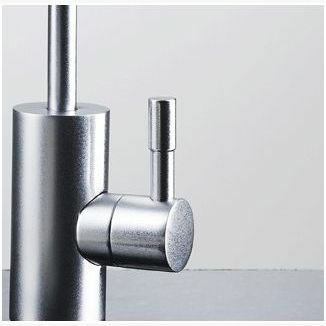 Answer: Care should be taken not to damage the plated or painted finish of the tap. To clean, all that is required is to gently wipe over the surface with a soft damp cloth. You should not under any circumstances use abrasive liquids, powders, or scouring pads to clean coloured taps. 17) Question: Is the 2000 system guaranteed? Answer: Yes, the stainless steel housings are guaranteed for 10 years and the rest of the system has a warranty for a period of twelve months after purchase (if free from defects in and workmanship, when properly installed, and operated in accordance with our Instructions. The cartridge life will depend on influent water quality, pressure and overall usage and is not covered by this warranty. 18) Question: Does the 2000 system remove nitrates? Answer: The 2000 system can incorporate specialist cartridge sets for special needs such as the removal of nitrates. A separate data sheet on this is available on request. The two health risks that are irresponsibly associated with nitrates are methaemoglobinaemia and stomach cancer. Methaemoglobinaemia Also known as the "blue baby syndrome", it is an extremely rare blood condition that is readily treated. In the last 49 years there have only been 14 reported cases of the disorder in the UK, the last one taking place over 27 years ago in 1972. Nitrates when ingested are converted by bodily processes to nitrites. Stomach acids or amines react with nitrites to form N-Nitrosamines. Despite speculation over a possible link with nitrosamines and carcinogenicity, the numerous studies carried out world-wide by various respected authorities have failed to establish any link between the two. In fact, incidences of stomach cancer are at their lowest in areas of high nitrate concentration. According to the World Health Organisation, only 22% of our average daily nitrate intake is attributable to water with the remaining 78% coming from food. Just one lettuce leaf reportedly contains up to 20 times as much nitrate as a single glass of water. 19) Question: Will the 2000 System fit a sink with a standard size hole? Answer: Yes. 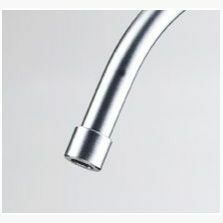 The base of the 2000 System tap conforms with European standards relating to the diameter of the tap base and the diameter of the fixing hole. 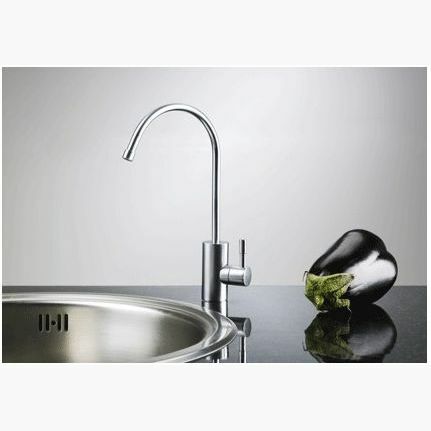 The thread size of our "touch-flo" tap is only 12mm so an additional drinking tap on any work surface or in the corner of any sink is very easy to install. 20) Question: I have heard that water filters breed bacteria, is this true? Answer: Yes, but it does not apply to the 2000 system. Certain carbon filters have in fact been criticised for their ability to breed bacteria. However, in fairness to the manufacturers of these, the situation has been widely exaggerated and only applies to heterotrophic opportunistic bacteria. By comparison the ceramic shell of the Definitive 'A' cartridge was originally developed for its bacteriological removal capability. The same ceramic shell incorporated in the Definitive 'A' design is currently being used world-wide by all British Embassies, the Ministry of Defence, Oxfam, UNICEF, the Red Cross and all other major disaster relief agencies, together with thousands of other respected organisations for the removal of, or protection against harmful disease-causing bacteria. 21) Question: Why is my water a milky colour? Answer: When your cartridge has been replaced there can be alot of air bubbles that are introduced to the water, this can result in a "grey" or "milky" like appearance to your water. Rest assured this is JUST thousands of tiny air bubbles that are working their way out of your system. These air bubbles will usually work their way out of the system within a few days, however if you would like to address the problem now please see below for instructions. One of the cheapest filters to run. The cartridges are fully recyclable and the system itself, provided care is taken, should last as long as you want it to. Only natural materials are used to filter the water ensuring all bacteria and pollutants are removed whilst leaving all the minerals and trace elements you need. Each system comes with a free reminder service. Here is a guide to delivery and returns. We are constantly looking to minimise delivery costs so some products may vary. All available delivery options will be shown in the basket and correct delivery will be calculated before you check out. You will only be charged one delivery cost. Not all options available for all products. To calculate accurate delivery cost to any address, please click ‘Estimate delivery cost’ above. Collection: We're pleased to say that this product can be collected from us at ItDoesTheJob.com HQ. If you want to pop in to say hello (and not worry about delivery!) then simply order over the phone on 020 8539 4707. We think you’ll be more than happy with your purchase. If you’re not, simply return to us within 30 days. New cartridges/ systems: Our water filters automatically come with the optimum cartridges for 99.9% of people- designed for British water. However, should you require/ desire, other specialised cartridges are available, see table below or contact us for more advice. Cartridge renewals: If you buy a water filtration system or a water filter cartridge from us, we have a complimentary reminder service- we’ll remember what you’ve got and when it’s due so you don’t have to. If you think we've forgotten you then please get in touch we'll do the rest!